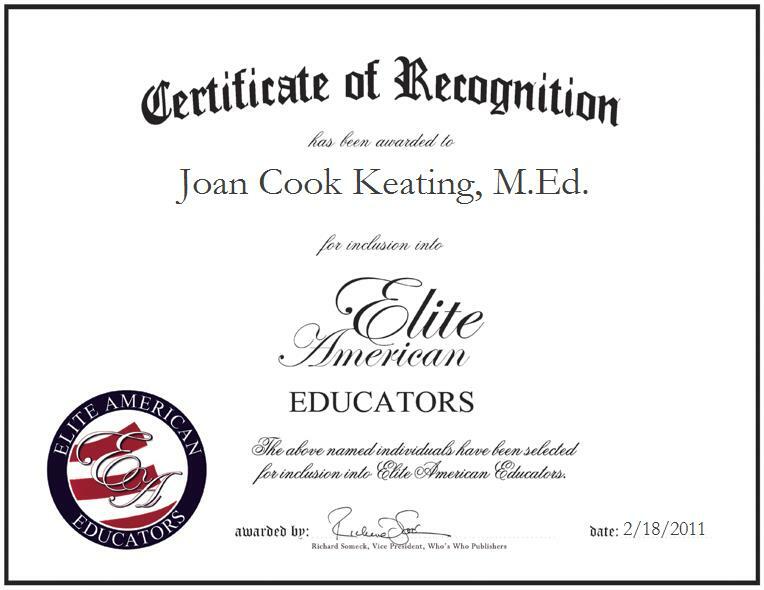 Colorado Springs, CO, February 18, 2011, Joan Cook Keating, M.Ed., Mathematics Teacher and Department Chairwoman for Wasson High School, has been recognized by Elite American Educators for her dedication, achievements, and leadership in secondary education. An expert in mathematics instruction, Mrs. Cook Keating performs a combination of classroom and administrative tasks for Wasson High School. She teaches classes in advanced placement statistics, pre-calculus, calculus and remedial mathematics, as well as functions as chairwoman of the mathematics department. In the latter capacity, she mentors and teaches new educators, monitors and maintains state testing requirements, evaluates curricula, conducts vertical teaming with the local middle school, collaborates with administrators and district associates, and advises the Mathematics Engineering Science School of Innovation. Mrs. Cook Keating earned a Master of Education in mathematics and technology and a bachelor’s degree in mathematics education from the University of Texas at El Paso, where she was the salutatorian of her graduating class. Mrs. Cook Keating is an active member of the Colorado Council of Teachers of Mathematics, the National Council of Teachers of Mathematics, and Phi Delta Kappa International. She has been awarded numerous honors for her hard work and dedication. These include the Governor’s Award for MESA Leadership in 2010, the Gib Funk Award for Community Service from the Colorado MESA Program in 2007-2008, Outstanding Colorado MESA Program of the Year for 2006-2007, inclusion in Who’s Who Among American Teachers for 2003-2007, the Nance Barthlow Leadership Award for 2002-2003, a Tandy Scholarship in 2000, Top Ranking Mathematics Coach for 1999-2000, a Certificate of Appreciation from the Colorado Classified School Employees Association, a Seventh out of Nine Top State Outstanding MESA Student Award, and two MESA Scholarships. For more information about Wasson High School, please visit www. cssd11.k12.co.us . Contact Joan Cook Keating M.Ed.